Most probiotic supplements today are based on “pure-culture” methods of manufacturing. This means the microorganisms are grown as individual strains in a sterile media. If the end microbial flora contains more than one strain, each strain is typically grown in a pure culture and then blended at time of packaging. Our product is very different in that we take selected strains and grow them in a “group”, in a process of co-association that combines multiple strains at once. Each strain interacting with other strains becoming a small eco system-- much more resilient and capable of working together synergistically. This is how microorganisms actually survive in their natural environment. 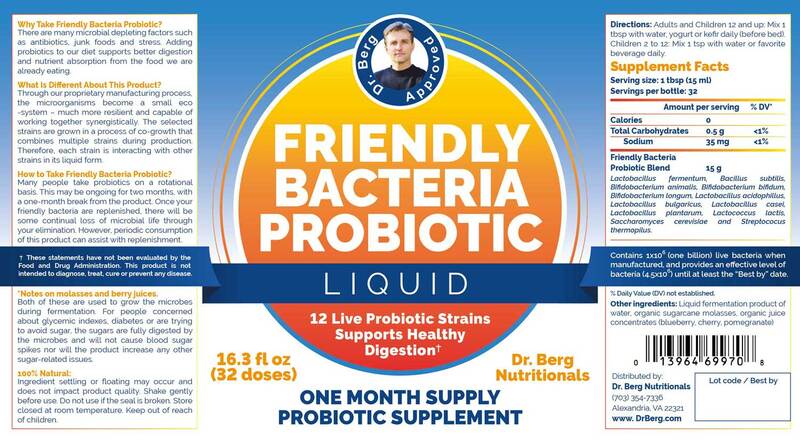 Friendly Bacteria Probiotic has been rigorously developed and tested for shelf-life stability. The minimum shelf-life has a guaranteed microbial life of 12 months; but could live up to 3 years. Our product survives temperatures between 41° to 122° F and pH range of 2 to 14. This means that our product does not require refrigerated storage. Each strain is not genetically modified and non-pathogenic. All ingredients used for culturing the microorganisms are natural and in most cases certified organic. We use our own microbial seeds and Mother Cultures in their own high-quality facility. By controlling its own manufacturing and maintaining rigorous process and quality-control standards, we guarantees a consistent, high-quality product. Start out using ½ to 1 tsp of material in a small glass of water before bed. Some people can experience a detoxification reaction if they take too much. As your body gets used to it, add more slowly until 1 cap per day is achieved.